I love apples–always have, always will. But ironically enough, I developed an allergy to raw stone fruits a few years ago, which means pretty much the only place I can eat them is in my baked goods! So when I look for quick bread recipes that contain fruit, I look for the ones that really showcase the fruit. 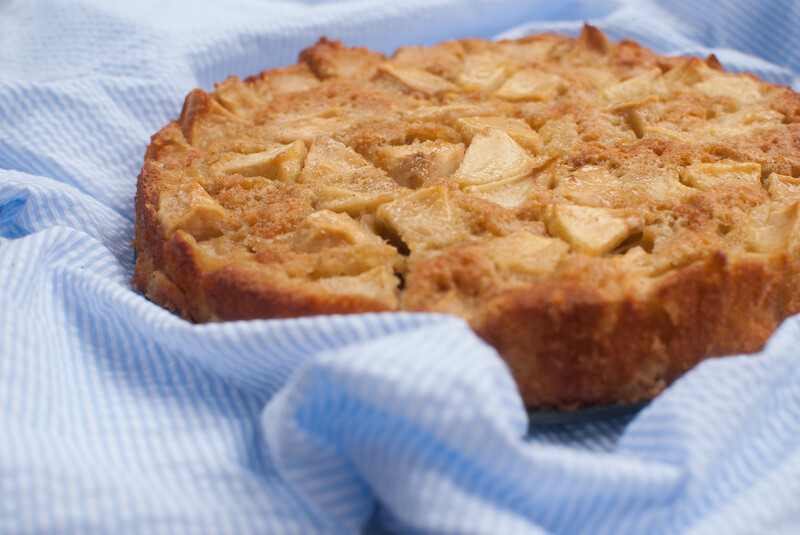 This apple cake (adapted from Food52‘s Genius Recipes cookbook by Kristen Miglore) fits the bill: made up of big chunks of apple bound together just barely by a cinnamon and rum-laced batter, this, my friends, is apple cake at its best. And to make it even better, it couldn’t be easier to make. To start you’re going to need to chop up a lotta apples. For even more depth of flavor, try to find a bunch of different varieties; I used Fuji, Honey Crisp, Granny Smith, and Gala if I remember correctly. Set those aside and make the batter. Start by combining some flour, salt, cinnamon and baking powder in a small bowl. 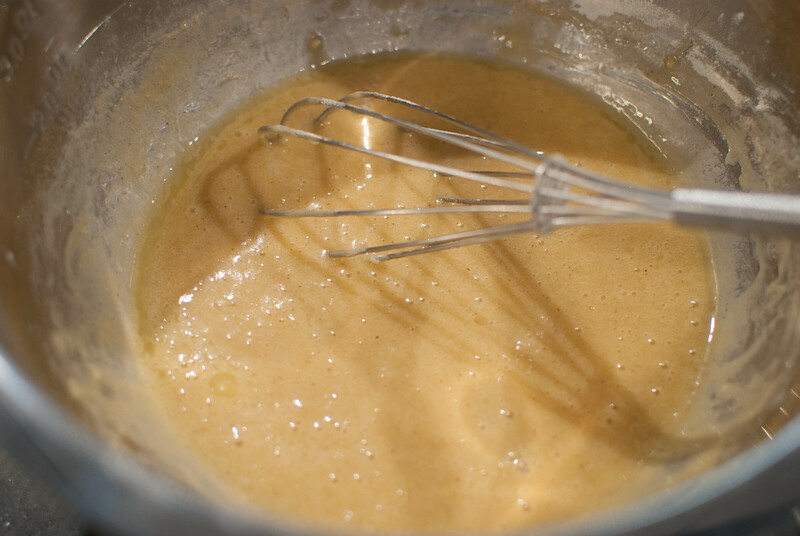 In another larger bowl, whisk a couple of eggs until they’re foamy. Stir in some sugar, a few tablespoons of rum and some vanilla, then add half the flour mixture and whisk until everything’s combined. Stir in a bit of melted butter, followed by the rest of the flour and a bit more butter, making sure to stir gently with each addition. In go the apples! It’ll feel like there is way to much fruit, but it’ll all work out in the end. Trust me on this one. The batter gets poured into a greased 9-inch springform pan that sits on a baking sheet. 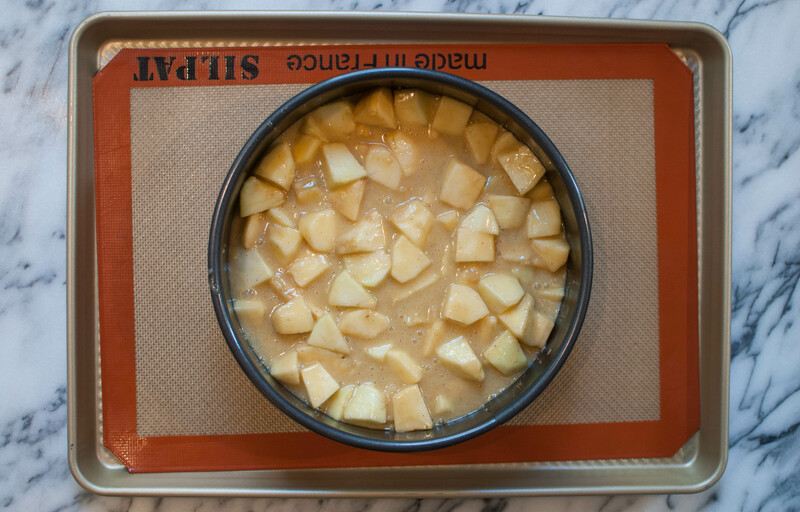 Poke the apples around a little until the top is even (ish), then pop the whole thing in the oven for around 45-55 minutes! Yum. The cake is ready when a toothpick inserted into a cakey section in the center comes out clean. 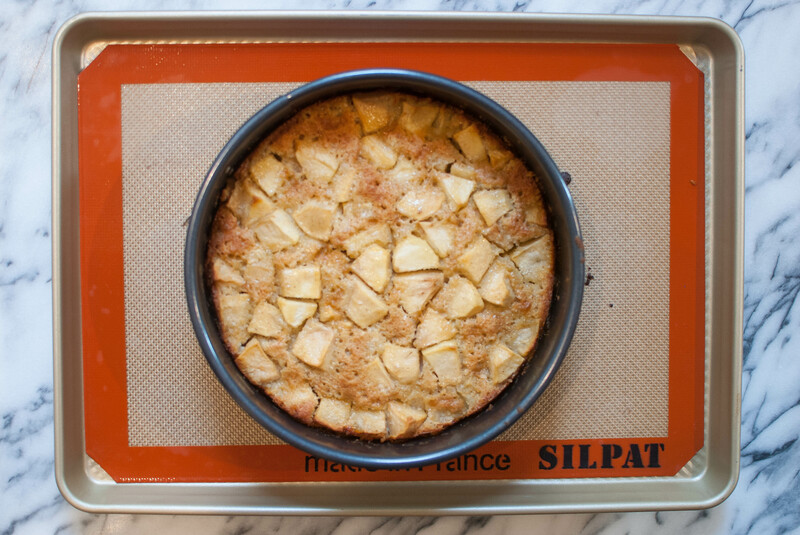 Cool on a rack for 5 minutes, then run a knife along the edge of the cake carefully to remove any stuck apples. Unlatch the sides of the pan and gently lift it away. I left my cake attached to the bottom of the pan for convenience’s sake, but if you want to remove it just wait for the cake to cool a bit more, then run a spatula under the bottom of the cake and invert it onto a wire rack or serving dish. Look at all of those beautiful apples! Make sure to serve this cake slightly warm, with a big scoop of whipped cream or vanilla ice cream. Preheat the oven to 350 F. Butter an 8 or 9-inch springform pan generously and place it on a baking sheet lined with parchment or a Silpat. 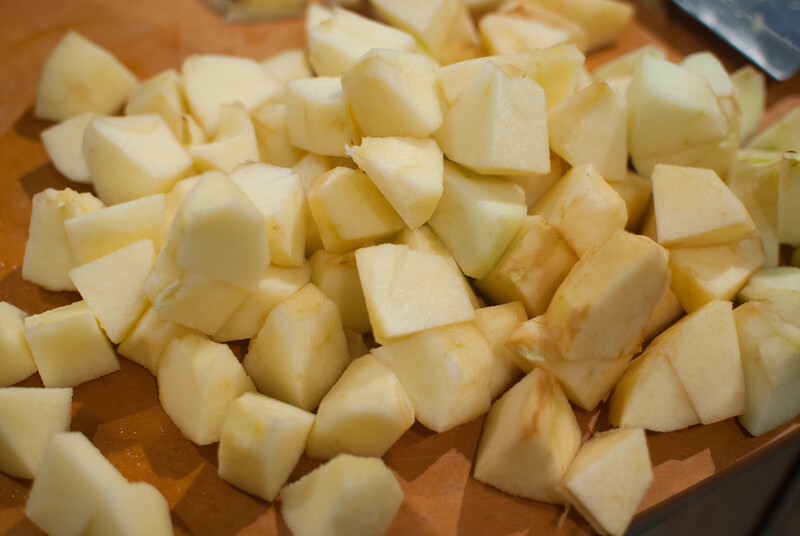 Peel and core the apples and cut into 1-1 1/2 inch chunks. Set aside. In a large bowl, whisk the eggs until foamy. Whisk in the sugar until combined, then whisk in the rum and vanilla. Alternate adding the flour mixture and the butter, starting with half the flour and mixing gently after each addition. 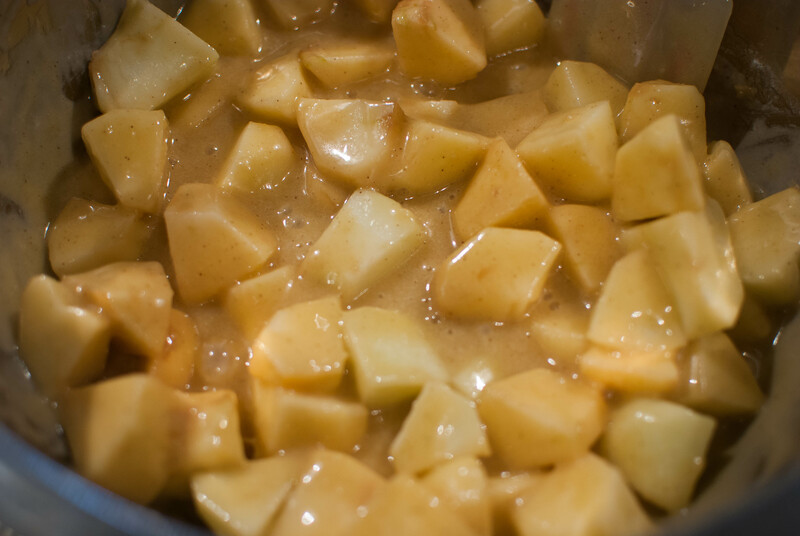 Use a rubber spatula to fold in the apples, the pour into the prepared pan. Poke the apples around until everything lies relatively even, and bake for 45-55 minutes, until the top is golden and a toothpick comes out clean when inserted in the center. 5. Cool for 5 minutes on a wire rack before running a knife along the edge of the cake carefully to remove any stuck apples. Unlatch the sides of the pan and gently lift it away. I left my cake attached to the bottom of the pan for convenience’s sake, but if you want to remove it just wait for the cake to cool a bit more, then run a spatula under the bottom of the cake and invert it onto a wire rack or serving dish. Serve warm with whipped cream or vanilla ice cream!